This 6000 watt 144 volt to 120/1240 Volt pure sine wave inverter and converter is a combination of power inverter, battery charger and AC auto-transfer switch with a peak DC to AC conversion efficiency of 88%. This Sigineer Power 6000 watt inverter charger changes 144 Volt to 120/240Vac split Pure Sine Wave output. It is also a built-in 40 amp transfer switch will automatically switch between shore power and battery-bank power within 10 mili seconds. A 20 amp multi stage battery charger uses AC power from the grid or from a generator to recharge a battery bank. The LCD on top cover gives out inverter status, the buttons allows customer to change inverter specs. Inside of this 144Vdc inverter charger are heavy duty transformers producing the clean pure sine wave power of low THD. 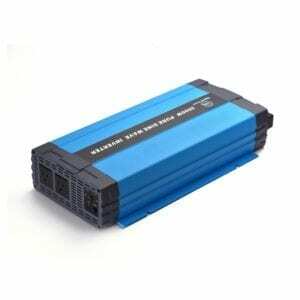 It is able to handle spikes from unstable power supplies in countries with unreliable power system. With a frequency switch, this inverter can be used in countries with a 50hz 120v ac system or 60hz 120v systems. 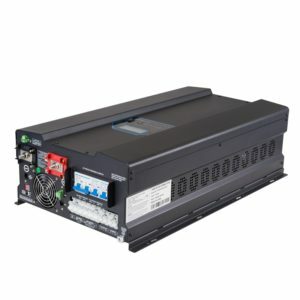 The reliable transfer switch boasts an average 10 millisecond transfer time , working actually as a uninterpretable power supply with battery backup system.